Tel Aviv University emeritus professor of history, Shlomo Sand, mostly specializing in French and intellectual history. He’s engaged in a virtual second career promoting the notion that Jews are not a historic people and that the current crop of Jews are not substantially descended from the ancient Hebrews of the Biblical era or the Judeans of the kingdom founded by the Hasmoneans. His anti-Zionist books, most prominently The Invention of the Jewish People (2010) and The Invention of the Land of Israel, have won Prof. Sand a wide following. 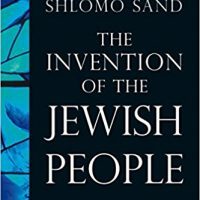 If Sand had intended to argue that Zionism, like all nationalisms and all ideologies engages in its share of myth-making– i.e., exaggeration to advance the cause– he’d be correct. But he argues as if there’s no basis in shared historical and contemporaneous experiences for multitudes of Jews to embrace Zionism in some form, beginning in the late 19th century and especially following the Holocaust and the creation of the State of Israel. None other than the Palestinian-American historian and activist, Rashid Khalidi, wrote that “National identity is constructed; it is not an essential, transcendent given . . .” (from his 1997 book, Palestinian Identity: The Construction of Modern National Consciousness, which I reviewed at the time). Sand employs every argument he can to invalidate the Jewish/Zionist narrative. He argues tendentiously as an ideologue, rather than a scholar. Yes, most religious Jews were not Zionist prior to the Holocaust, but a few were. These included Orthodox Jews who spawned the National Religious Party and the B’nai Akiva youth group. While most Reform Jews were also not Zionist, Rabbis Stephen Wise and Abba Hillel Silver were the most prominent American Zionists of their day. And Conservative Judaism was always overwhelmingly supportive of Zionism. Yes, there is genetic variability among Jews, but probably not as much as he claims; during most of Jewish existence in the Diaspora, intermarriage was outlawed by both Christian and Muslim authorities, and opposed by Jewish communities as well. As to his contention that Jews were not actually “expelled” from Judea because there was no Roman decree, the land was so devastated by Rome’s suppression of the two great revolts in the first and second centuries of the Common Era that most Jews could no longer sustain themselves there (nor for a time could they even legally practice Judaism). It’s also wrong-headed to argue that Zionism didn’t really rescue Jews. As many as half a million Jews living in the Palestinian Yishuv of the 1920s and ’30s would otherwise have perished in Europe. This includes the 60,000 Jews ransomed from Nazi Germany under the unfairly-maligned Transfer Agreement.